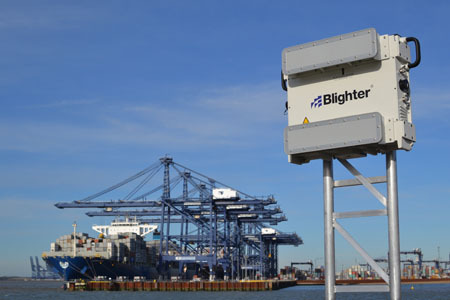 Blighter Surveillance Systems is a British electronic-scanning radar and sensor solution provider. It delivers an integrated multi-sensor package to systems integrators comprising the Blighter electronic-scanning radars, cameras, thermal imagers, trackers and software solutions. Blighter radar solutions are used at Heathrow and other international airports, by the British Army for force protection, and in numerous asset protection and border security applications, including monitoring the Korean Demilitarised Zone (DMZ). Blighter radars combine patented solid-state passive electronically scanned array (PESA) technology - utilising digital beamforming (DBF) on transmit and receive - with advanced Frequency Modulated Continuous Wave (FMCW) and Doppler processing to provide a robust and persistent surveillance capability and an unmatched combination of high reliability, accuracy and performance with a low cost of ownership. 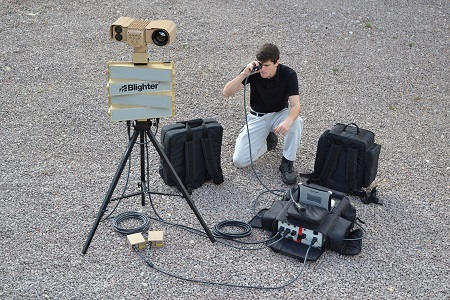 The Blighter radar was the first commercial electronic-scanning ground surveillance radar on the market and its modular solid state design - uniquely low power due to the PESA technology - continues to give Blighter the edge over other e-scan radars. 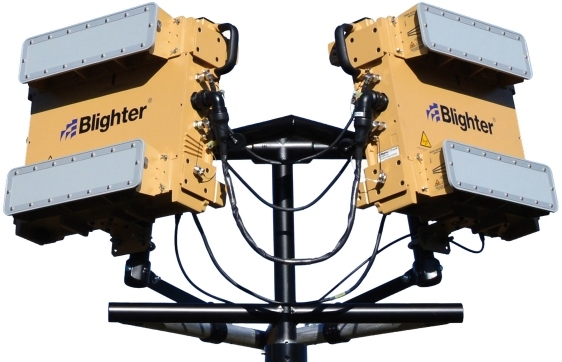 Unlike traditional active electronically scanned array (AESA) antennas, which use multiple power-hungry power and phase control elements, Blighter's unique PESA units require just one efficient transmitter and one receiver unit per radar unit. Due to this compact and simple architecture, Blighter uses e-scan modules on both the transmit and receive paths resulting in exceptionally low side lobe levels, which allows it to operate in complex and cluttered environments without detecting phantom targets from large targets outside of the radar beam. The Blighter radar allows both fast scanning simultaneous with Doppler velocity filtering using its 'Coactive Doppler fast-scan' capability. Traditional non-Doppler radar can scan fast, whereas traditional Doppler radars rotate slowly. Blighter achieves the best of both capabilities. 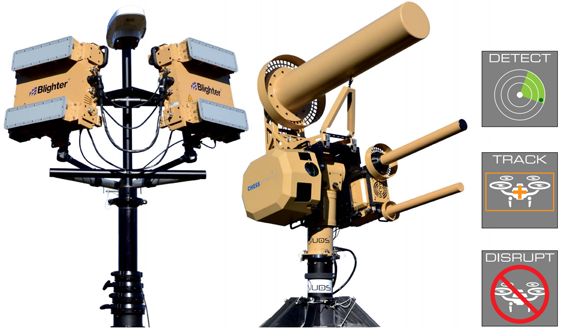 Blighter ITAR-free PESA radars are used worldwide in commercial, government and defence markets, area and asset protection for national border security, homeland security, critical infrastructure protection such as airports, coastal surveillance, and in military applications. the B400 series radars are for long range (0-2, 5, 8, 16 or 32km), fixed or mobile installations on towers, buildings or other pieces of fixed infrastructure. The B400 series radar is a modular design allowing from 90° of electronic scanning on the B402 up to a full 360° on a B442 radar. the B202 Mk 2 is a medium range (0-8km), lightweight, man-portable and/or vehicle-mobile radar capable of electronically scanning 90°. 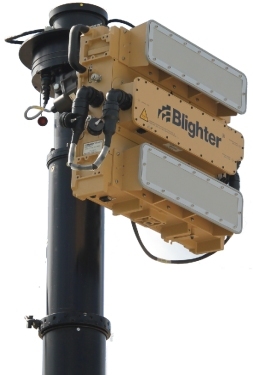 Blighter Revolution 360 radar is a low-cost, lightweight vehicle-mobile radar for use on vehicle masts and trailer masts. Uses a single B400 series radar unit. Option with integrated electro-optic system is called Blighter Scout.